What real people have said about Forge Leadership Network. Forge is providing a tremendous service to the conservative movement. By building a farm team of future leaders, organizations like The Heritage Foundation have seen its benefits firsthand. One of Forge’s Fellows, Rachel del Guidice, interned at Heritage and quickly made her mark. Now, she’s part of our reporting team at The Daily Signal and she’s covering the biggest news stories happening in Congress. Thanks to Forge’s training, Rachel understands how the legislative process works and she’s prepared to take on the assignment. I hope future Forge Fellows follow the same path. The [Forge grad] I hired has been as good as advertised! I can see why Forge thinks so highly of him and why you recommended him so strongly. He’s been a great addition and not just me, but everyone in our office has been very impressed. Forge is providing an invaluable service, building up the next generation of conservative leaders and public servants who are well prepared to take on the noble task of preserving our republic and creating a brighter future. Their efforts to help place graduates in positions where they can give back to their community is vital to growing the conservative movement. The incredible importance of the Forge Leadership Network simply cannot be stated loudly and clearly enough. The future of Faith, Family, and Religious Freedom will be shaped by the very generation that this organization will influence. The America my grandchildren will experience will be profoundly touched by Forge, and for that I am deeply grateful. At the Forge Leadership Summit, young adults are immersed in real-life learning experiences, where they are taught the principles that made America great and trained to be effective champions for the truth. Forge Leadership Network is not just developing young leaders – it is cultivating the next generation of American statesmen. Forge Leadership Network has been an invaluable resource as I pursue the goals God has set before me. Forge has come alongside me and given specific, professional counsel that I could not have received anywhere else. The guidance I have received in this critical transition stage between school and career will affect the rest of my life. "I’m proud to support the good work that Forge Leadership Network is doing to identify, train, and equip our state’s best young conservatives. Together, we can empower the next generation of Ohio’s conservative leadership to begin restoring our state and nation." Among the array of conservative leadership organizations Forge stands apart. Strategically equipping the most talented students with a sound understanding of first principles and real-world, hands-on leadership experiences maximizes the possibility that the next generation will be the one to put America back on track. 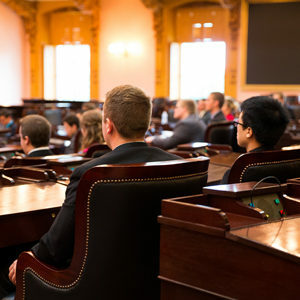 Experiencing the various legislative simulation exercises enabled me to better understand the political process and sparked my interest to learn more. In addition, the speakers were phenomenally encouraging and informative. I’ve been looking for something like this for over a year – [Forge] is an answer to prayer. I am a better Christian, friend, and man because I met you all at this Summit. Meet the organizations who believe in the vision of Forge.